In many applications, a robot has to interact with the surrounding environment in order to perform some useful task. When a manipulator interacts with an object a very profound change occurs. 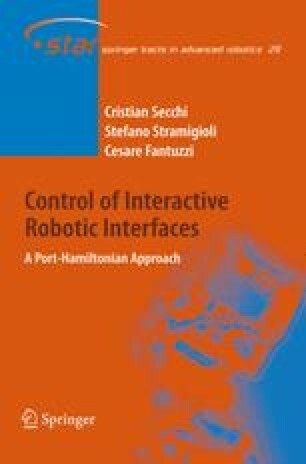 In fact, before the contact, the controller has to control only the motion of the robot; after the contact, the manipulator dynamically interacts with the environment and the controller has to manage a new dynamical system made up by the robot coupled with the environment. It has been proven in  that even if the controlled robot is stable in case of free motion, its behavior could become unstable when there is a contact with the environment.